Starring Chris Pratt and a host of other famous faces, Guardians of the Galaxy becomes the latest Marvel comicbook to be transformed into a major blockbuster film. After the death of his mother, a young Peter Quill is abducted by aliens, growing up to become a scavenger who retrieves objects for payment. When Peter (Pratt) takes an orb from abandoned planet Morag, however, he soon finds himself in the middle of a war against the planet Xandar. Accompanied by a rag-tag band of companions, will Peter be able to prevent the deaths of millions of innocent people? Much of the film is, as you would expect, given to typical Marvel affair – fight scenes and the rise to heroism. Peter is set against typical deep-voiced villain Ronan the Accuser (Lee Pace), who is accompanied by Karen Gillan’s rather unconvincing portrayal of blue-skinned alien Nebula. The universe is at stake, whilst Quill is as usual trying to come to terms with his past and all of the things he has lost on Earth. What makes Guardians of the Galaxy more than just a bog-standard sci-fi movie, however, is its humour. I’m notorious amongst my friends for being completely against comedy films, but Guardians of the Galaxy did make me laugh. 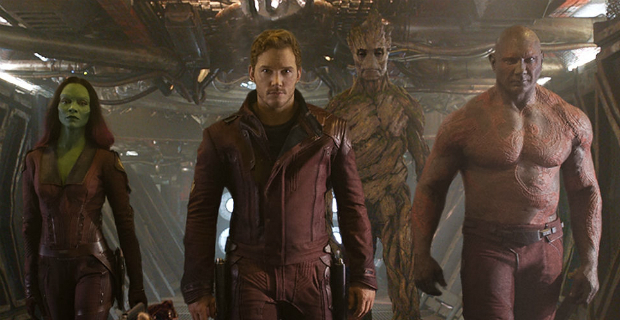 Rocket (Bradley Cooper) in particular became endearing for his capacity to crack a joke at any inappropriate circumstance, whilst Groot’s (Vin Diesel) timely announcements of ‘I AM GROOT’ added a certain light-heartedness to the film. Guardians of the Galaxy is also unafraid to poke fun at itself. Rocket mocks the typical way in which his fellow characters stand up in turn to suggest alliance, and Peter Quill’s almost clumsy attempts to save the world and flirt with Gamora (Zoe Saldana) make him likeably pathatic, something we’ve perhaps not seen before in a Marvel film. What Guardians of the Galaxy lacks in character development and coherent plot it makes up for in self-reflexive humour and choice selection of mid-to-late twentieth century pop music. Peter Quill is certainly endearing if only for being the first hero in history to defeat a villain by singing and dancing, and the clash between alien and human conceptions of ideas is priceless. Quill refers to the film Footloose as a human legend, and Drax’s (Dave Bautista) inability to understand metaphors is amusing for an English student like me. Guardians of the Galaxy is definitely worth a watch, but it doesn’t stand-out as exceptional amongst Marvel films.